We implement a variety of security measures to maintain the safety of your personal information when you place an order. We offer the use of a secure server. All supplied sensitive/credit information is transmitted via Secure Socket Layer (SSL) technology and then encrypted into our payment gateway providers database. It will only be accessible by those authorized with special rights to such systems. They are required to keep the information confidential. After a transaction, your private information will not be stored on our servers. All reservations require a 50% deposit. There is a two-night minimum on all properties. There may be a different minimum stay requirement during Holiday periods. Online bookings require payment of the deposit by credit card. We accept Visa, Mastercard, American Express, Discover, Checks and Cash. A credit card is necessary for booking, however, if making payment by check, deposit check must be received within 5 days of booking and balance must be paid thirty days prior to arrival date. A fee of $35.00 will be charged on all returned checks. The balance due on credit card bookings will be charged 30 days prior to arrival. Full payment of all bookings must be received no later than thirty days prior to arrival. You must be 21 years of age to make a reservation. Upon receipt of deposit payment and signed rental agreement, reservation will be confirmed via email or regular mail. If your reservation is cancelled for any reason, you will be charged a non-refundable $50.00 fee. If you cancel 61 or more days prior to arrival, you will receive a refund, less a $50.00 cancellation fee. If you cancel less than 60 days prior to arrival, you will forfeit your deposit. If you cancel within 30 days of arrival, your total balance becomes non-refundable. Guests are responsible for all nights reserved regardless of late arrival or early departure. There are NO refunds for “NO-SHOW”. Idaho Vacation Cabins is not responsible for acts of God. 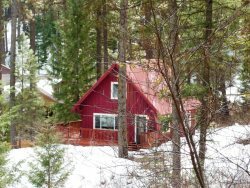 Conditions which Idaho Vacation Cabins cannot control (i.e. weather, temperature, rain, snow, etc.) are not considered grounds for a refund. How are the cabins priced? Rates are based on occupancy, including adults and children 5 and older. The listed rate is the base price for 4 people and there will an additional charge of $15 per person per night up to the maximum occupancy of each property. We feel it is fair to all guests to base our rental rates on 4 guests and to charge per person for each additional guest. If we base the price on the highest occupancy of a cabin, this would unfairly over-charge guests with less than the maximum number of people. Some properties are priced with a flat nightly rate, mostly properties that sleep 6 or fewer people. In addition to the nightly rate for each cabin, we must collect an 8% Sales and Travel Tax, a one-time cleaning fee, and a pet fee if applicable. Cleaning fees are based on the amount of work that must be done to clean the cabin and hot tub after your departure. The amount of cleaning fee is flat and differs for each property. Many of our properties are pet-friendly. There is a extra charge of $50 per pet. Your pet must be approved by management and the additional Pet Addendum must be signed. All of our homes are thoroughly cleaned after each stay, but, if you are allergic to pet dander, we are unable to guarantee that you will not have a reaction to a home that has been regularly occupied by pets. Also, some owner have their own pets, but do not allow guests to bring pets. If you are sensitive, please be aware that we cannot guarantee any property, even if it does NOT allow pets. If travel insurance is purchased, you will receive a full refund for any nights of your reservation cancelled due to a death in the family, illness, flight delays, flight cancellations, or road closures due to bad weather. You can add Trip Protection up to 30 days prior to your reservation. If you are booking and your check-in date is already within 30 days of your reservation, Trip Protection may only be added within 24 hours from the time of booking. Maximum capacity is listed for each property. Exceeding the maximum must be pre-approved by management and there maybe additional fees. Property changes are possible, however there is a $50 change fee. If the change results in a higher rental rate, it is the guest's responsibility to pay the difference. Please call our office if you wish to purchase a reservation for another person. Driving directions to our Check-In cabinet will be emailed to you 3 days prior to your arrival. In our cabinet you will find directions to the cabin, keys/code and rental instructions. If you have different groups traveling at separate times, contact the office and we can email the directions for you to send out. Can I use MapQuest, Google Maps, GPS to find the office or my cabin? NO! Please don’t! They don’t seem to know how to find us! Review your information, clear and accurate directions have been provided to our lock box and we have specific directions to each cabin. We want you to arrive safely and on time for your stay, not be left wandering the forests lost and lonely! Our check-in time is 4 p.m. Our check-out time is 11 a.m. Early arrival and late departure is sometimes available for an extra fee. Times When other guests are arriving or departing the same day, we cannot allow early/late check-ins/outs, as housekeeping will not have enough time to prepare the cabin for your arrival. Late arrival is no problem, as our lock box is accessible 24/7 and is lighted for your safety. What do we need to do at check-out? Please strip all linens and deposit in laundry area. Leave pillows, blankets and covers on the bed. Please start a first load of linens, if there is a washer/dryer in the home. If you have time to start a second load, housekeeping will be ever so happy! Gather all used towels and put on bathroom floor. Load the dishwasher and turn it on. Clean the kitchen of any food spills. Remove any perishable food from the refrigerator/freezer. If you must leave it, please leave only unopened items. Thank you! Gather all trash and put into the outdoor cans. Put back any rearranged furniture. Be sure fires are dead out. Turn down heat to 55, A/C to OFF. Turn off all lights. Return your key to the lock box by 11 A.M.
Tell all your friends what a good time you had! We will contact you if we find items that you have left behind. We charge $15 plus postage to cover our costs to return the item to you. Any items not claimed within 2 weeks will be donated to a local charity. What’s in the cabin? What do we need to bring? All of our units are privately owned and will differ in décor and other items. Linens, towels, dishes and basic kitchen items are provided. All the beds, with the exception of sleeper sofas/futons, will be made with fresh linens and bath towels will be set out for you. To get your vacation started, we supply you with a basic supply of toilet paper, paper towels, soap, shampoo, coffee, sugar and creamer packets (1-2 day supply). It is your responsibility to purchase these items locally if your needs exceed the supplied items. Please bring your own beach towels for use outside of the cabin. We ask that you not take cabin towels to the pool or river. Will there be gas for the BBQ or wood for the firepit/fireplace? We keep the BBQs supplied with propane tanks. We check them after every rental, but we cannot guarantee the supply. If you run out, please contact the after-hours numbers you have been provided and we will get you a tank right away. If your cabin has an outdoor fire pit, no wood will be supplied for this. You can bring your own, buy bundles from us and we can have them delivered or there is wood available locally for purchase. Please be sure when you leave the cabin that all fires are dead out! During the winter, cabins that prefer using wood for the main heating source will have an adequate supply of wood for heating. Very few homes in our area have air conditioning. It typically cools off in the evenings, so we suggest opening the windows to let the fresh mountain air in. Most cabins do have fans to help circulate the air. Homes that are heated by geothermal water are quirky and usually cannot be controlled by a thermostat. If you are too hot, open the windows and the cabin should cool down very quickly. Will my cell phone work and is there a phone in the cabin? Cell phone service is sporadic in the mountains! Only Verizon works to any meaningful degree at some of our cabins and other cabins have no cell reception at all. Most of our cabins have phones, but only for local (Garden Valley) calling. Calling cards can be used to call out of the local area. Please note that when you load up an empty refrigerator with a large amount of warm food, it may take a bit for your food to get cooled down, however, sometimes refrigerators do break down. In this case, please contact us right away and we’ll do what we can to resolve the situation. All of our cabins have well water and minerals that may cause a natural discoloration of water, sinks, toilets, etc. The water is drinkable, but if you prefer, you may wish to bring your own water for drinking. The same minerals in the water also effect the hot tubs and may discolor this water as well. All TV’s and media players are different and although we check them frequently cannot guarantee their operation. Please check your specific cabin to determine whether you have satellite, cable or movies only Homes with satellite, etc. will all have a different cable package. We cannot guarantee TV service or TV channel availability. If you wish to purchase a special package for your stay, please contact is and we will try to arrange it, if possible. If your unit is furnished with a hot tub or a pool, you are advised to use at your own risk. You will be required to sign a separate addendum. All hot tubs use well water with minerals that may cause a natural discoloration of the water. Children are not allowed to be unsupervised by an adult. Please keep soap, shampoo, oils, alcohol and food away from and out of the hot tubs. Do not stand or sit or allow children to stand or sit on the hot tub cover. If you damage the cover, the charge to replace it will cost you at least $400.00. Hot tubs are cleaned and serviced weekly, as well as between renters. If extra cleaning is required after your departure a charge of $75 will be billed to your credit card on file. Covers should be kept on the hot tubs whenever the tub is not in use. NO PETS ALLOWED IN HOT TUBS! Sometimes, non-human residents of the mountains may decide to join you at your vacation cabin. All of our properties border or are within the boundaries of the Boise National Forest and although we perform regular pest control, most of our cabins are located in a wooded, mountainous environment and we do not guarantee them to be free of all pests, insects or animals. They can be stubborn and re-appear within hours of being taken care of and this includes flies, wasps and mosquitoes! We cannot offer any compensation for the presence of pests, insects or animals. If you have a particular problem, please contact us and we will do our best to resolve the issue, however, some tolerance is expected due to our mountain location. We hope you enjoy watching the variety of wildlife such as birds, bats, deer, raccoons, foxes, cranes, eagles, elk and even the occasional bear or mountain lion! In the mountains, periodic blackouts caused by wind, rain, fallen trees, ice or sometimes traffic conditions can occur. For us, outages are a way of life! Your phone should still work and you can call us to find out if the outage is just related to your cabin or our entire area. As a visitor, you may feel a bit uneasy; we understand, so to put your mind at ease, we have stocked all cabins with flashlights. If your cabin will be out of power for a considerable time, we will do our best to move you to another unit, but cannot guarantee that one will be available. You can also call the Idaho Power Outage Line at 1-800-488-6151.